Friday Bill and I took Cally on a college visit to Mt Union. Wow what a beautiful college. Cally loved it. We got a tour of the college from the Golf coach. Mt Union wants Cally to play golf for them on the women's golf team. She is excited about this opportunity. She has had several colleges contact her about playing on their golf teams since the golf season has ended for her high school career. Mt Union has a very competitive golf team and she is excited to get the chance to play on a winning women's golf team! She has not committed yet but I think she is really close to making this final decision. I will be happy when this is all decided and planned out. Brown the beef and drain. Fix taco meat according to package directions. Spray a p x13 pan with cooking spray. Assemble the Enchiladas...take tortilla and spread 1/6 of the can of refried beans, then 1/6 of the taco beef, and a handful of cheese, roll up the tortilla and place in the pan. Repeat with the next 5 tortillas. After all enchiladas are in the pan, pour both cans of enchilada sauce over the enchiladas. Cover with the remaining cheddar cheese. Bake in 350 degree oven for 25 to 30 minutes or until hot. Serve with taco sauce and sour cream if desired. Mix sugar and cinnamon together. Spray tortillas with cooking spray, sprinkle with cinnamon sugar. Cut tortillas in wedges. 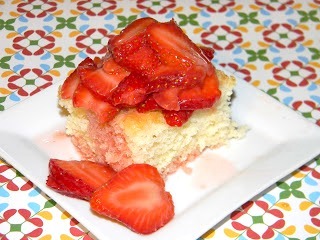 Place on a baking sheet and bake in a 350 degree oven for 8 to 10 minutes. This bread pudding is wonderful. I do not know where I got this recipe but I ran across it the other day while cleaning up my desk. Cally works at a mini mart that sells Schuler's donuts and she brought home some glaze donuts the other night. 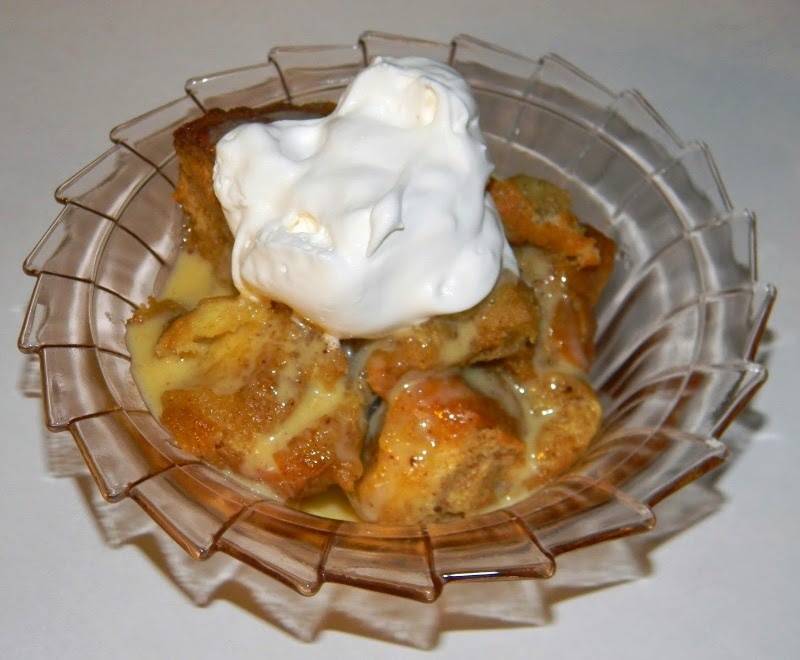 This bread pudding is perfect for stale donuts. The pudding mixture softens up the stale donuts then once they are soggy you bake them and then the custard sauce you make to pour over your warm bread is out of the world good. If you like custard pudding you will love this sauce! In a bowl whisk together the eggs, egg yolks, salt, vanilla, heavy whipping cream, milk, sugars, cinnamon and ginger until smooth. Place the donut pieces in a large bowl. Pour custard over the donut pieces and let stand for about an hour to allow the donuts to absorb the custard. Preheat oven to 350 degrees. Place bread pudding into a 3 qt casserole dish and bake for 30 minute. Whisk together egg yolks, sugar, vanilla and cinnamon in a bowl until smooth. Heat the cream in a sauce pan over medium heat just until it comes to a boil. Remove the pan from the heat and whisk hot cream into the egg yolks 1/4 C at a time until it has become incorporated. Return the entire mixture to the sauce pan and cook over low heat stirring constantly until the custard is thickened and coats the back of a wooden spoon. Do not boil as the custard will curdle. Immediately pour the custard though a fine-mesh sieve into a bowl and whisk until very smooth. Refrigerate until ready to use. After bread pudding comes out of the oven, cool slightly then serve warm with custard sauce and whipped cream...yummy! If you liked the Buffalo Chicken dip I posted and you like pizza then you will love this pizza dip. I made this dip after church today as a quick snack. 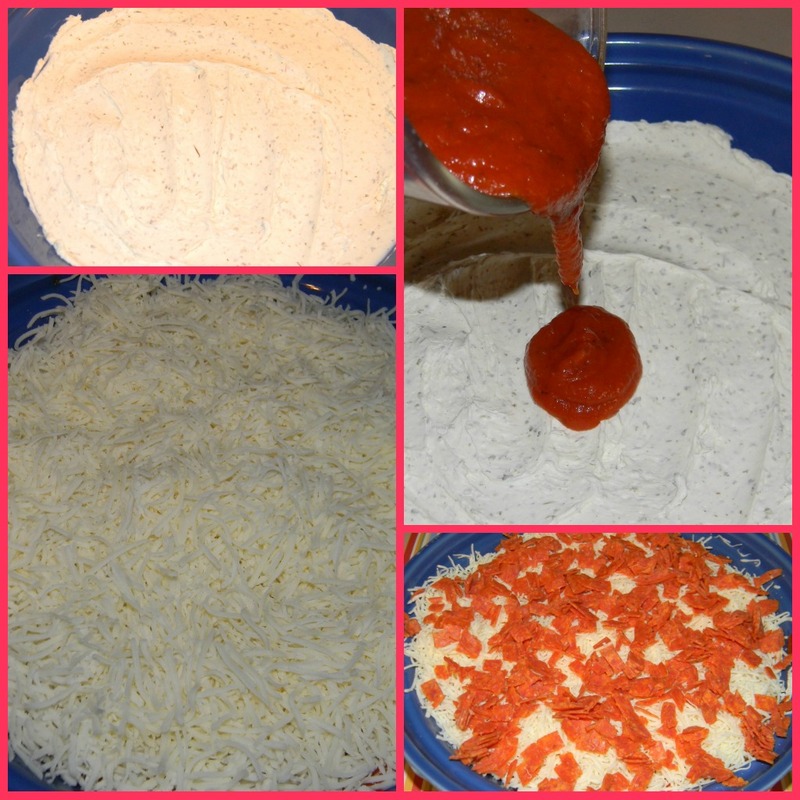 It is like taking crust (your cracker) and dipping it in pizza toppings (your dip) wow, it sure is good! I did not follow the directions, I was not paying enough attention. I layered the cream cheese mixture, then the pizza sauce and then all 2 cups of mozzarella cheese and then topped with pepperoni. Even though I did not layer the cheese in the correct order it still tasted great! Oh goodness...this pudding is luscious. If you like peanut butter you will LOVE this pudding. It is thick and rich and oh so peanut buttery smooth. My dogs were begging for this pudding the whole time it was cooking. I used my vanilla bean paste in the pudding...look at all those vanilla bean seeds on the measuring spoon. In a saucepan, combine sugar, cornstarch and salt. Gradually stir in milk and whipping cream; bring to a boil over medium heat. Cook and stir for 2 minutes. Remove from the heat; stir in peanut butter and vanilla bean paste until smooth. Pour into serving dishes; refrigerate. Garnish with whipped cream if desired. If you like Mexican and Pasta you will love these Taco Stuffed Pasta Shells. It is like eating tacos with a fork. This is one dish that Bill likes taking for lunch. They heat up really well as left overs. I pack left over supper every night for Bill's lunch the next day. It really saves us a lot of money by him being able to pack and heat up his lunch each day. Preheat oven to 350 degrees. Brown meat and drain. Prepare meat with the taco seasoning according to package directions. Boil pasta shells for 12 minutes. Drain shells. Take shells and fill them with the taco meat and place them in a 9 x 13 greased baking dish. Continue filling the shells until all the meat is used. Pour taco sauce over each shell. Cover dish with foil and bake in oven for 15 minutes. Take shells out of oven and place cheese in each shell. Then place crushed fritos in each shell. Put back in the oven for 10 minutes. Garnish with sour cream and more taco sauce. 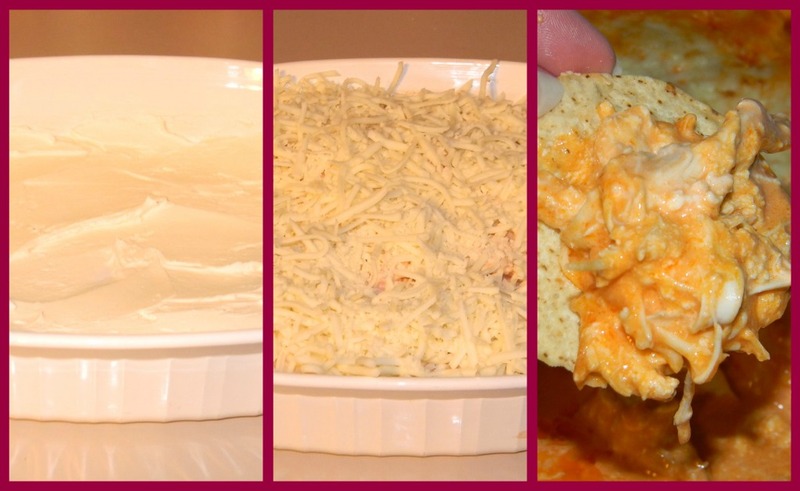 If you like hot wings you will like this dip. This dip is awesome but unfortunately our Bengals were not today. We had this dip while we watched the Bengals football game today. Cally has also entered this dip in the Chicken dish of the day competition at the fair and she placed 2nd in 2009. Cally and I finished editing Shelby's senior pictures this weekend. 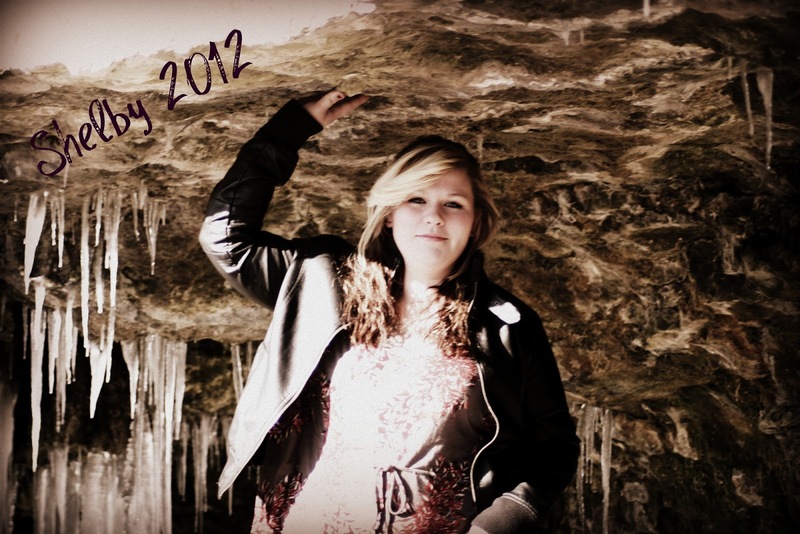 Here is one of my favorites that Cally edited. 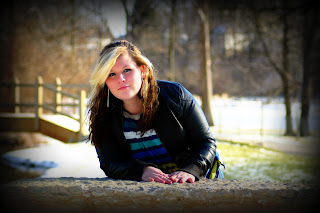 Shelby wanted her pictures taken in the snow but here where we live in Ohio there has been little snow. In fact the last couple of days have been unusually warm for January. If you are using rotisserie chicken then you just have to shred the chicken off the bone. If you are using chicken breast then Boil or simmer chicken in water for 30 minutes or until the chicken is cooked. Heat oven to 425 degrees. In oven safe dish, spread cream cheese on bottom of dish. Shred chicken in a separate bowl. Add bleu cheese dressing and hot sauce to the chicken. Spread the chicken mixture over the cream cheese and sprinkle with the mozzarella cheese. Bake for 20 minutes or until cheese becomes bubbly. Serve with tortilla chips. I used a few of my Christmas presents tonight. I made these donuts with my new mini donut maker that Cally gave me and I used my vanilla bean paste that Billy gave to me. The vanilla bean paste is awesome. 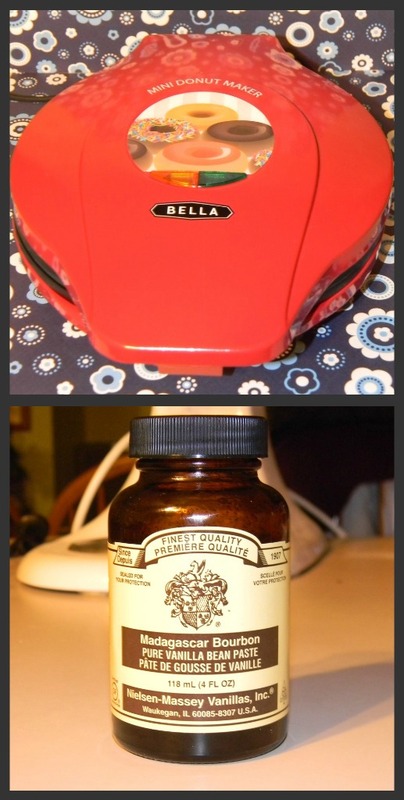 I used it in cheesecakes this weekend too and the vanilla bean seeds can be seen all over the cheese cake. The flavor taste like you have used triple the vanilla. I love it! The donut maker worked good. I used the plain donut recipe but instead of using milk I used pumpkin spice coffee creamer. The glaze has both butter and water and it has a nice buttery taste to it. When I glazed the donuts I just dipped the donut down into the bowl of glaze and then sat them on a cooling rack, it worked perfect.